By Azzief Khaliq in Social Media. Updated on November 19, 2017 . Facebook’s been around for a long time, and if you’ve been using it for more than a year or so then your Timeline is probably full of links, posts and memories that you’d love to be able to revisit whenever you please. Whether it’s just for nostalgia’s sake or whether you’re looking for that one interesting link posted to your Timeline a while ago, being able to search through your Facebook timeline is a really handy feature. Sadly, you can’t do this through Facebook just yet. But QSearch is a third-party tool that can help you out. 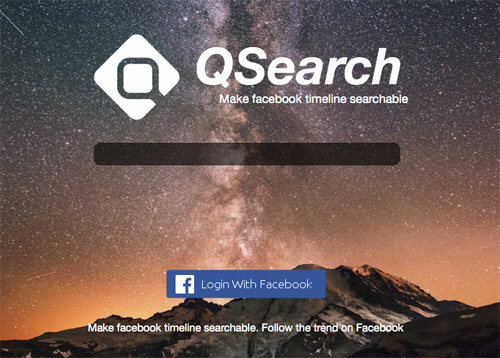 QSearch is a web app and Chrome extension that lets you search through Facebook Timelines. Not just your Timeline, either; you can also use QSearch to search through your friends’ Timelines, as well as Pages and Groups. In essence, it’s Google for Facebook. 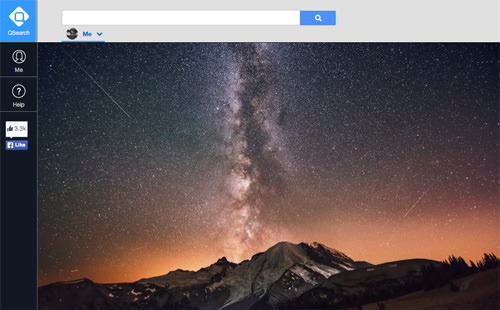 QSearch is available as a web app and a Chrome extension. Both are pretty much identical, with the only difference being that the Chrome extension simply displays the web app in a smaller window. The screenshots here will be from the web application. When you first access the app, you’ll be greeted by the main splash screen. Click on Login With Facebook to get started. 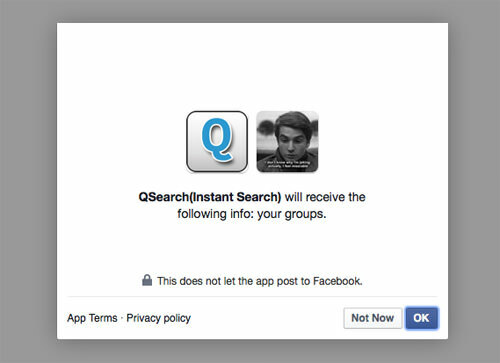 You’ll be redirected to Facebook, where you’ll be asked to grant certain permissions to QSearch. The permissions aren’t particularly problematic, but if you don’t like non-Facebook services having access to your Facebook information then this app definitely isn’t for you. Click on OK if you’re fine with the permissions that QSearch needs. Once you do that, you’ll be redirected back to the QSearch web app, which you can now start using. QSearch’s interface is quite minimal and simple to use. This is the main QSearch screen, which you’ll see when you first access the web app. To search through your Timeline, just enter a search term in the search bar at the top of the screen. Pressing Enter or the search icon will bring up a list of results matching your search term. You can also click through to see the actual post on Facebook. 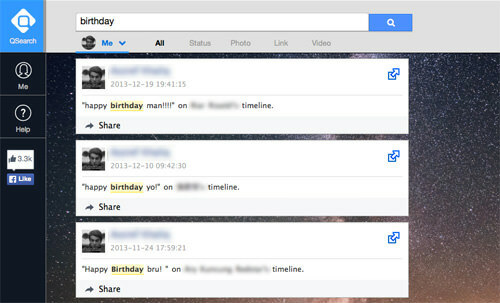 You can also search through your friends’ Timelines, as well as through Groups and Page Timelines. 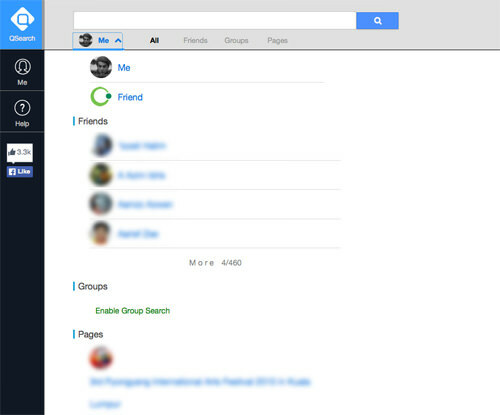 You can switch to any of your friends or Pages by typing in their names in the search bar, or you can click on Me just below the search bar to show a drop-down menu where you can choose a friend or Page to search through. The search works in exactly the same way, regardless of whether you’re searching through your own Timeline, a friend’s Timeline or a Page’s Timeline. Group Search isn’t enabled by default, although clicking on the Enable Group Search will redirect you to Facebook, where QSearch will ask for one extra permission. Beyond the Timeline search functionality, the only other notable option is a view that’s labelled Me, accessible from the sidebar. 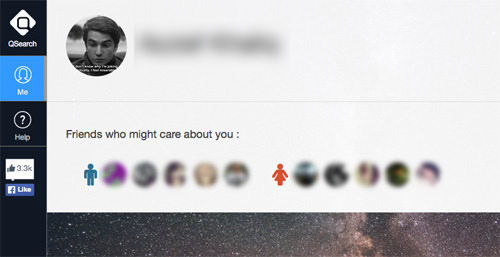 The exact purpose isn’t entirely clear, since all it does is show a small list of, in the app’s own words, friends who might care about you. All in all, QSearch is quite a useful tool for those who want to look for specific items or keywords on their or someone else’s Timeline. It’s not very feature-packed, but that probably was never the intention of the developers. 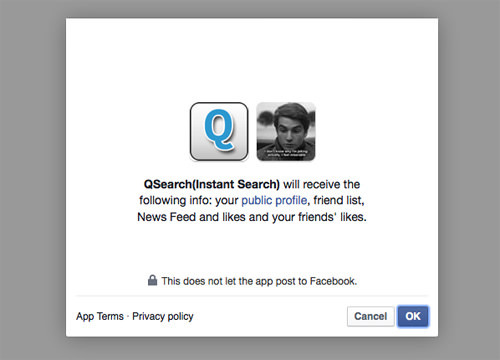 Facebook is in dire need of the ability to search through Timelines, and QSearch fills that need very capably. Best of all, it’s free to use, and the developers say that mobile versions are coming soon.